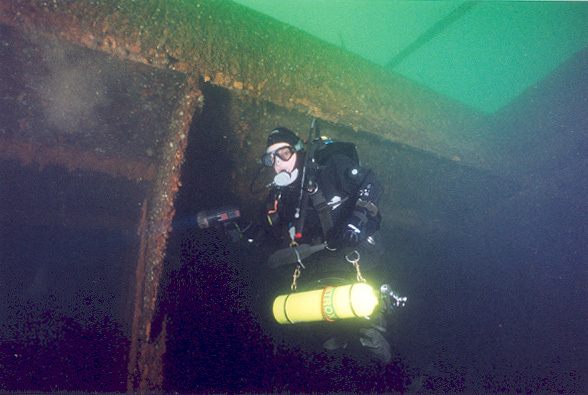 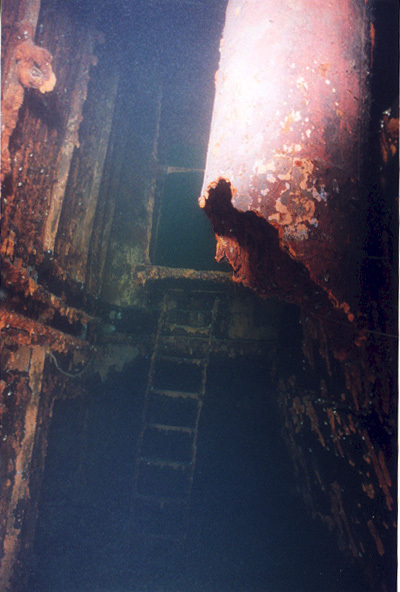 North Wind - note that my story of Northwind was published in Wreck Diving Magazine, Issue 5. 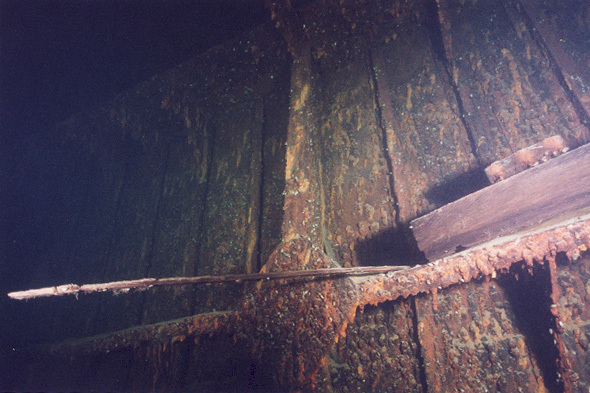 Northwind was one of the six sisters built in Cleveland, Ohio between 1888 and 1889. 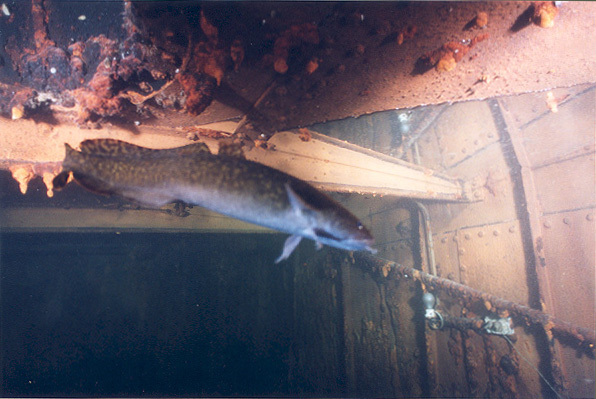 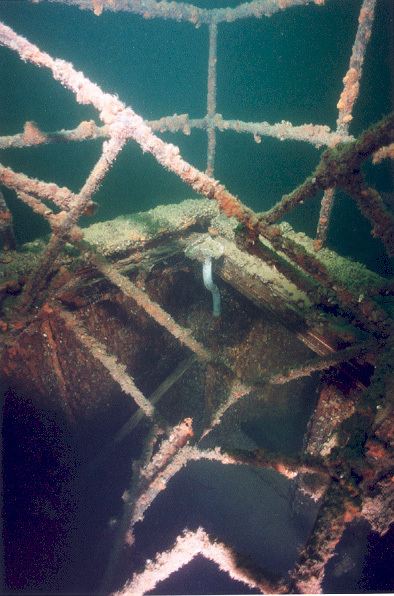 By 1926, she was the last one remaining in the Great Lakes. 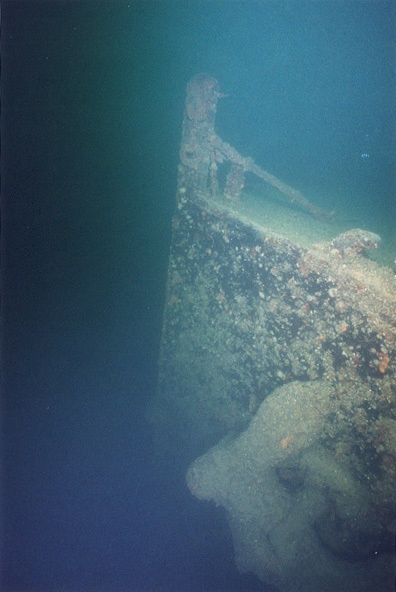 The North Star was the first to sink (I have visited her as well - see above). 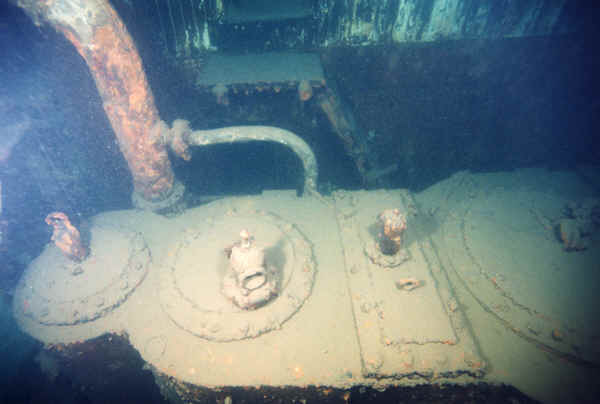 Remaining siblings were all sold for salt water use - of those four, three were eventually scrapped and Northern Light sunk off Florida Keys in November 1930. 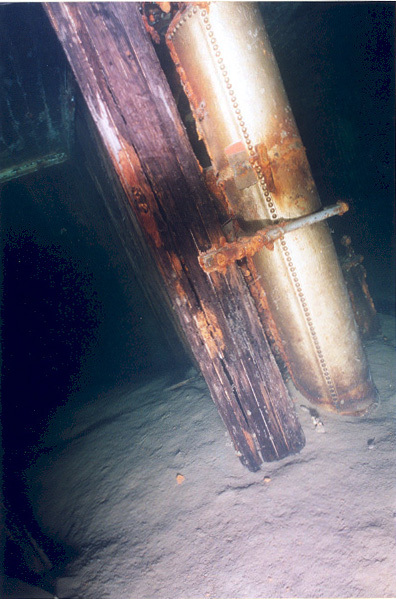 North Wind sank on July 1926 in the Lake Huron's North Channel near Little Current on the island of Manitoulin. 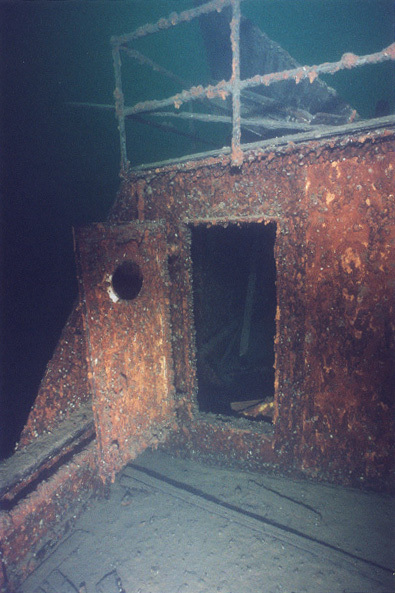 The best way to dive Northwind is from a live aboard called Dawnlight. 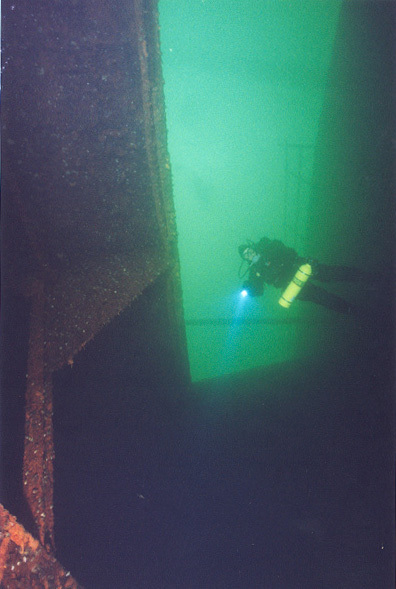 Dawnlight started its life as a working tug, but had been converted to a diving boat a while ago. 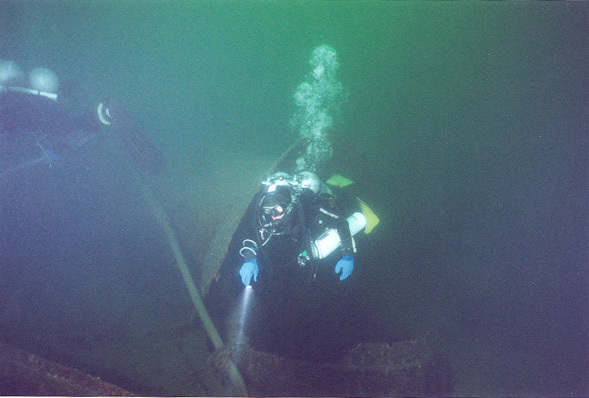 Its home base is Tobermory and it makes 3 and 4 day trips to Northwind making stops for other Tobermory wrecks on a way there and back. 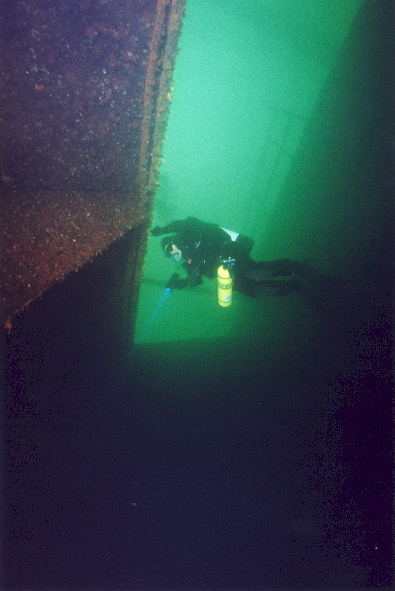 The stern is most definitely the best part of Northwind. 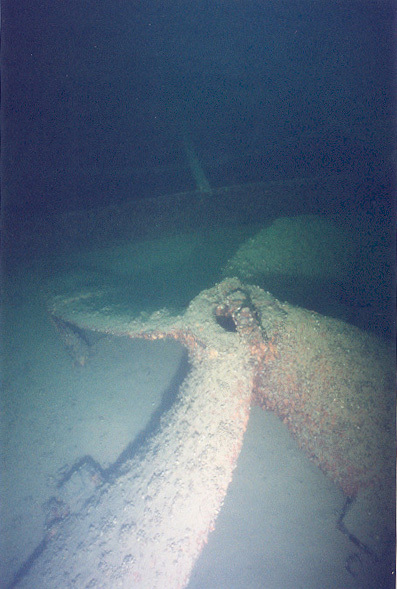 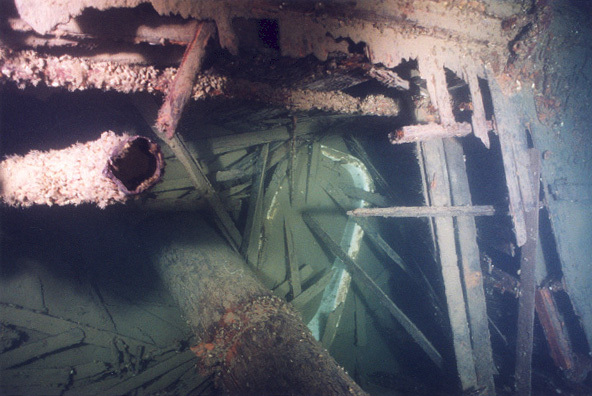 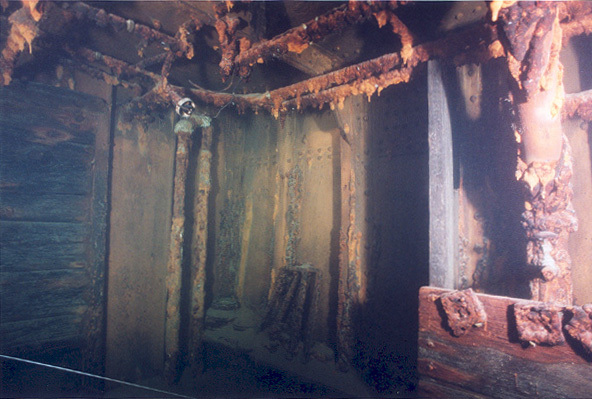 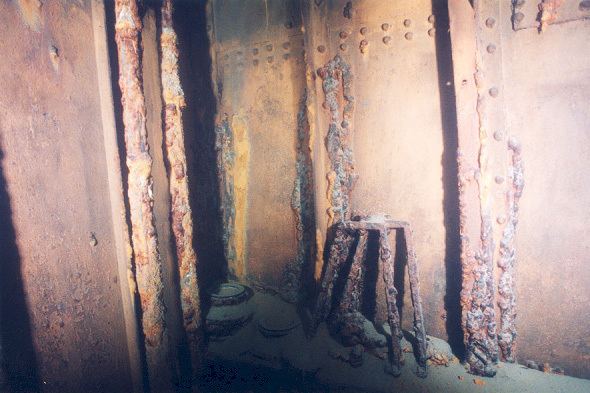 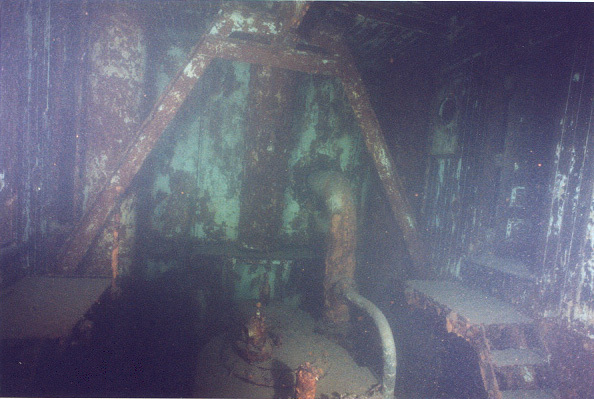 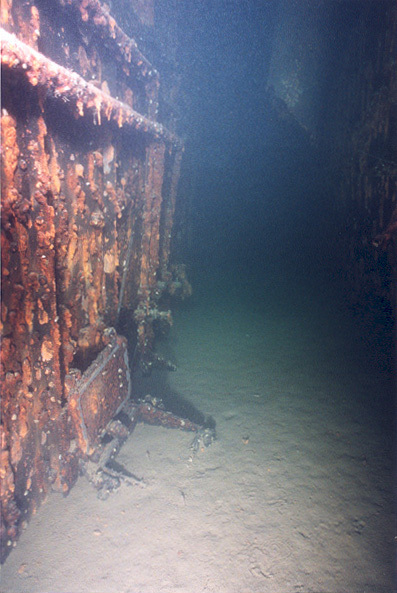 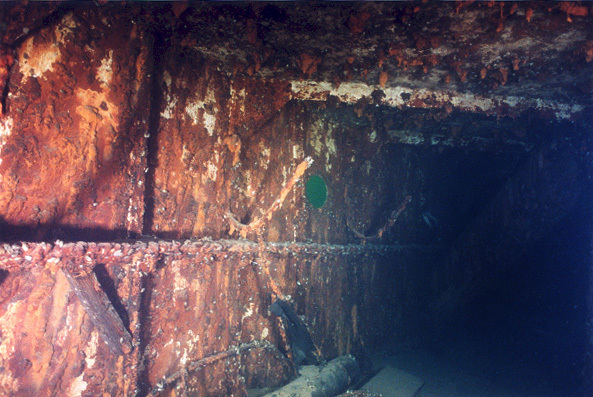 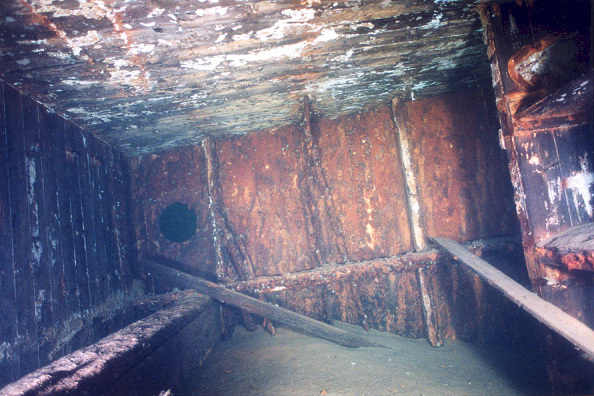 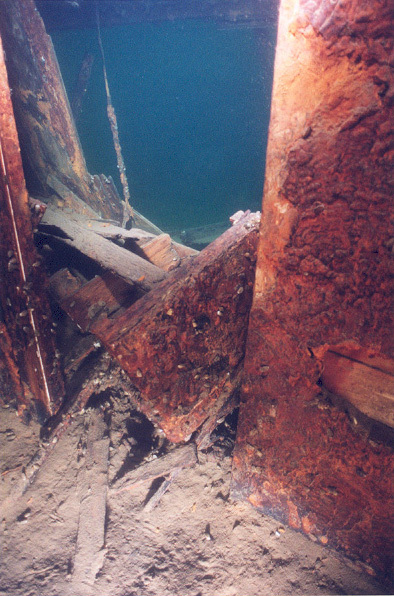 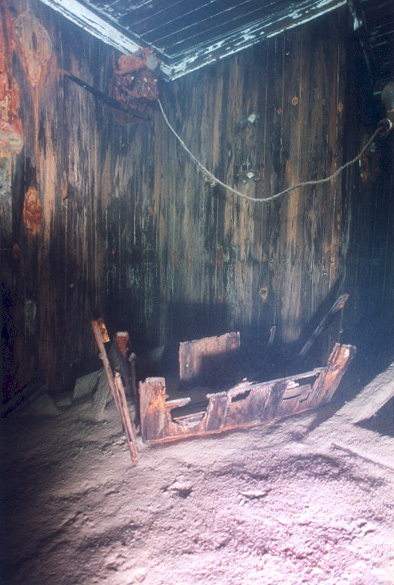 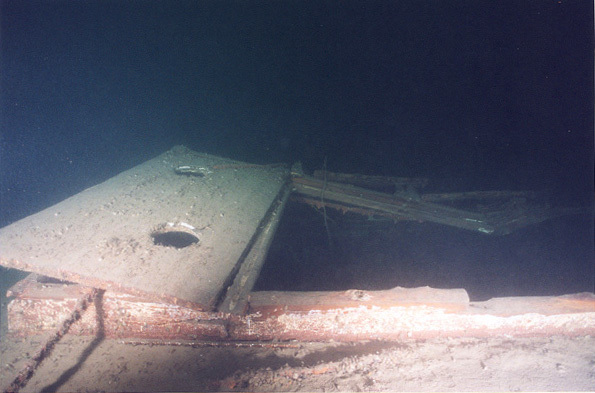 The stern structure, complete with the cabins and companionways it still upright and so intact, one can see the paint on the walls inside. 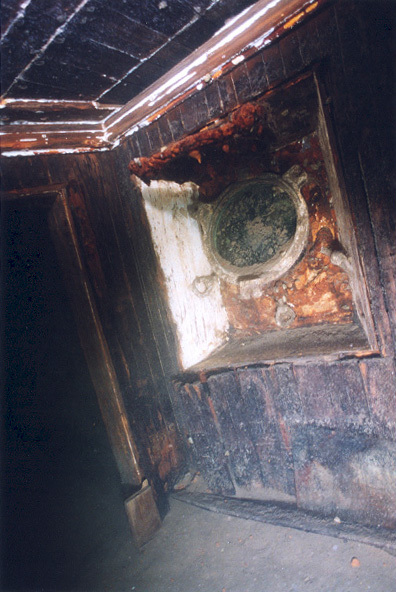 There are two points of access to the companionways on both port and starboard sides. 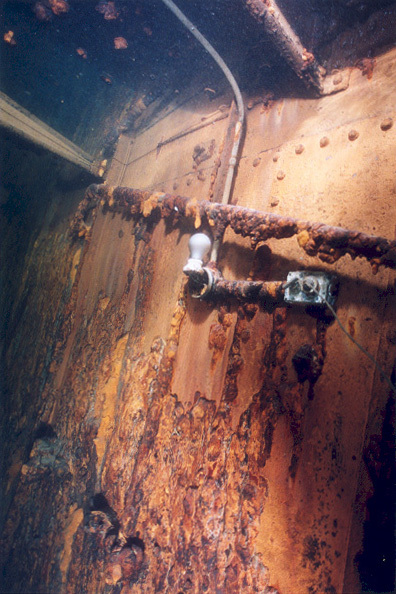 The easiest one is to go through the doors on both sides about 2/3 swim from the bow  the doors are on both port and starboard sides in the vicinity of the smoke stack. 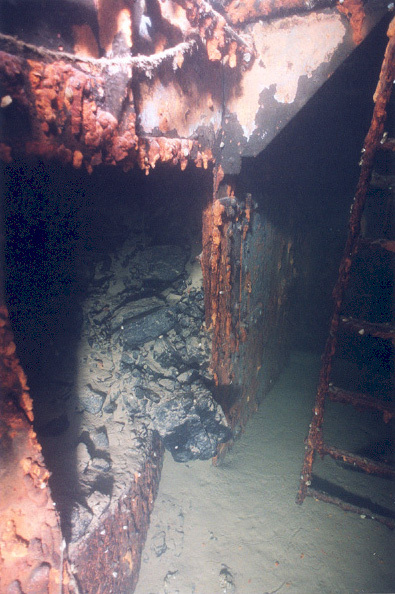 In fact, the starboard access door is right under the fallen smokestack. 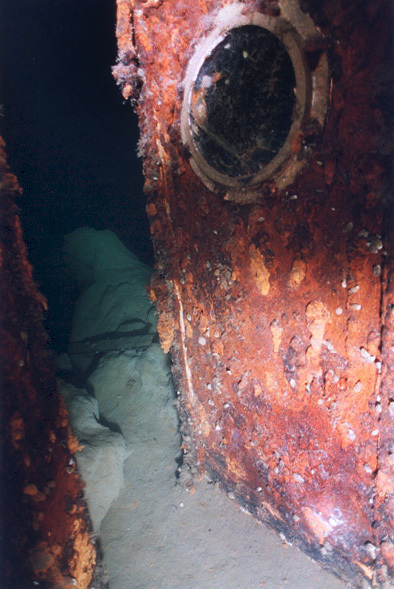 The other way it through the hole at the very stern left when the cabin on top blew away. 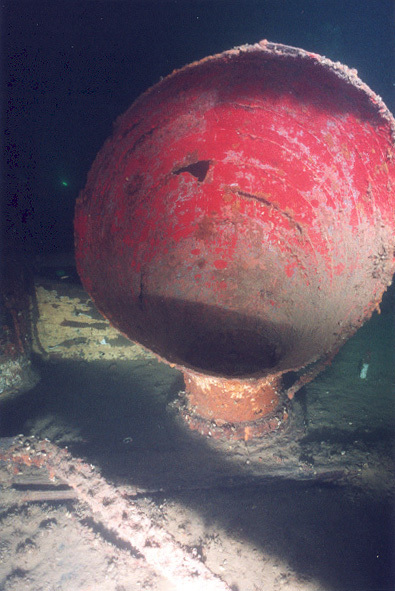 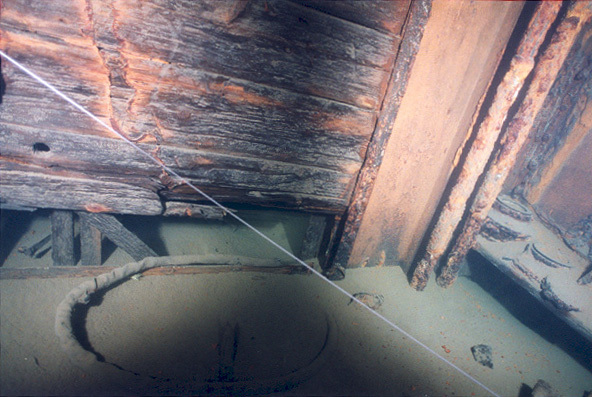 The hole is easy to find  it is square and it is at the very center of the stern. 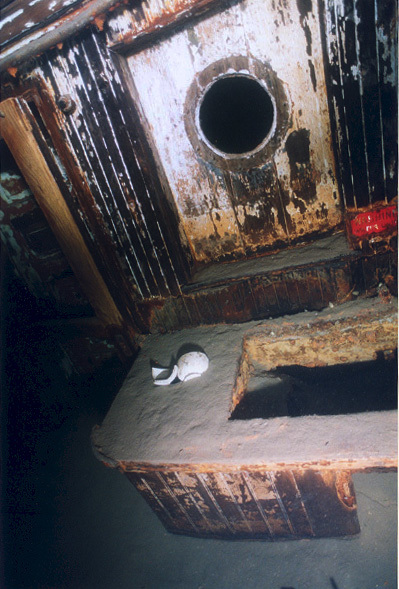 Once there, you have a choice of three doors  the door in the center towards the bow leads to the galley, mess and the storage room. 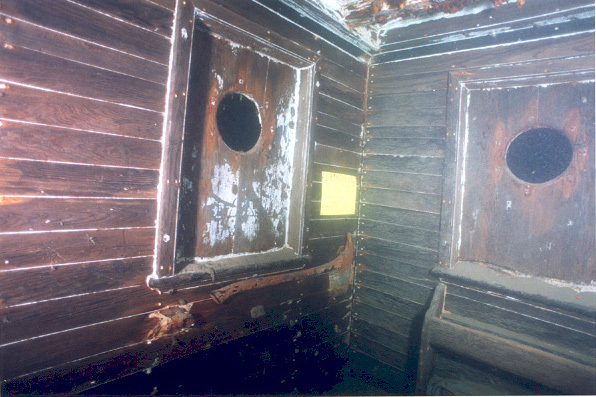 Both side doors would take you to port and starboard companionways. 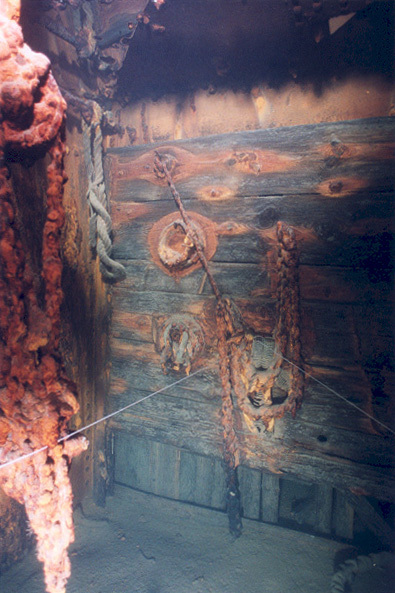 The port companion way is the more interesting one as most of the cabin doors are opened and the contents can be seen. 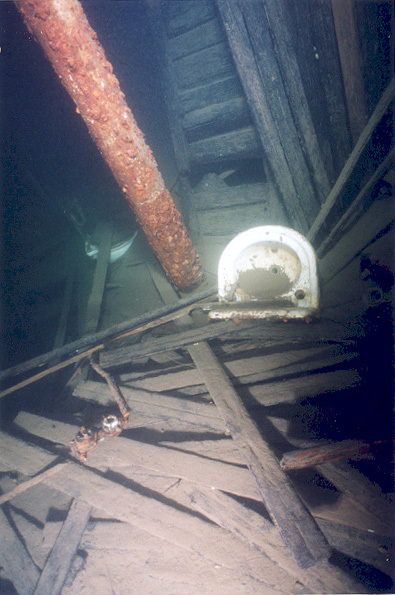 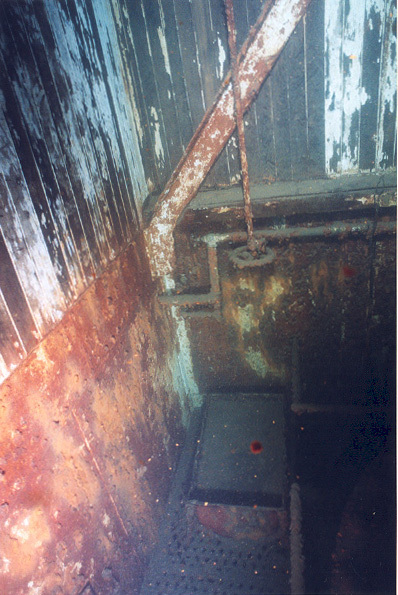 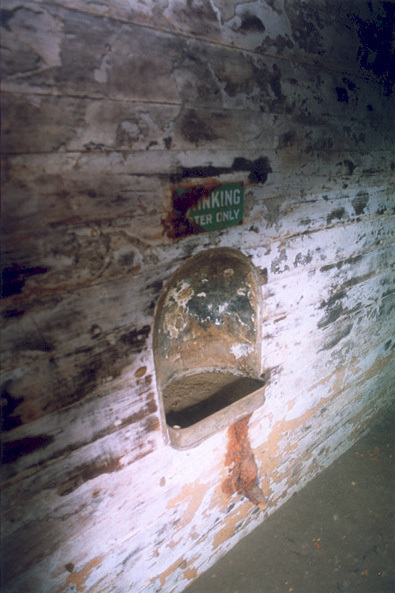 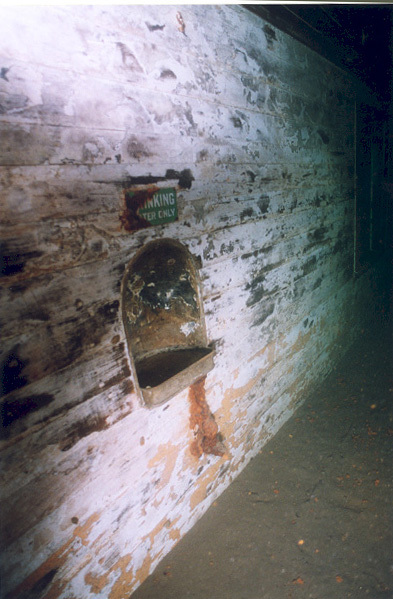 Some of the items inside include the remains of the toilets and sinks. 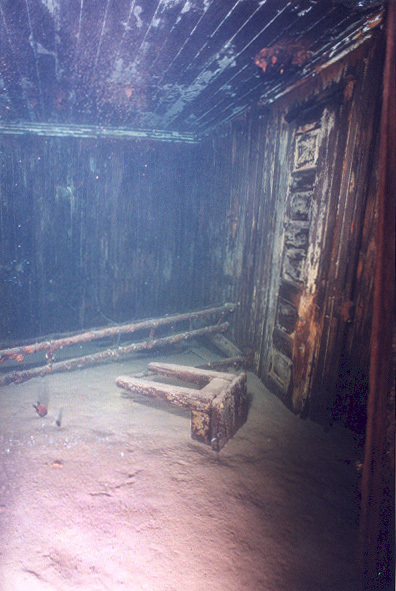 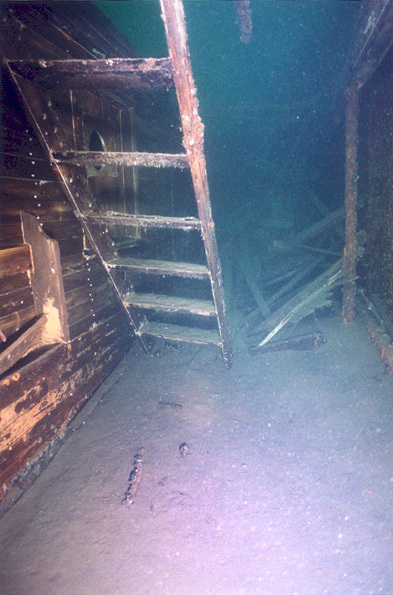 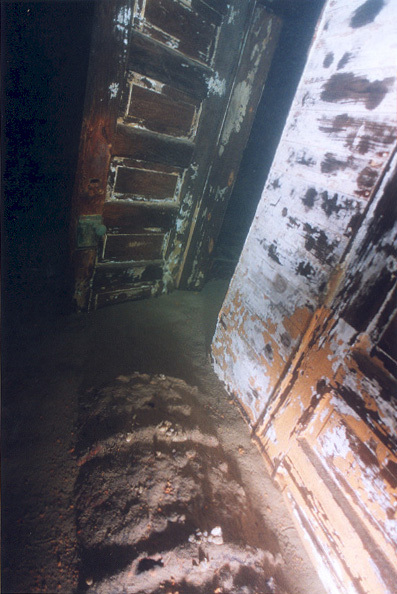 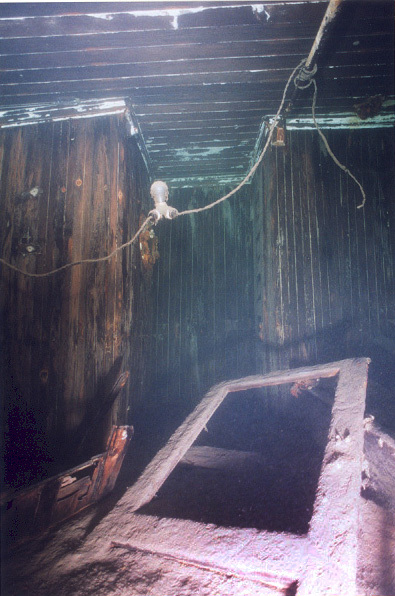 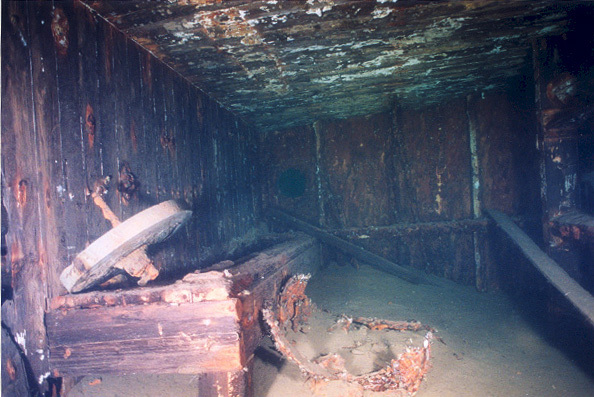 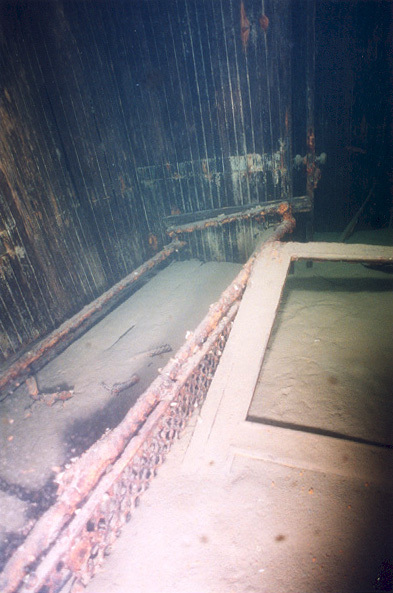 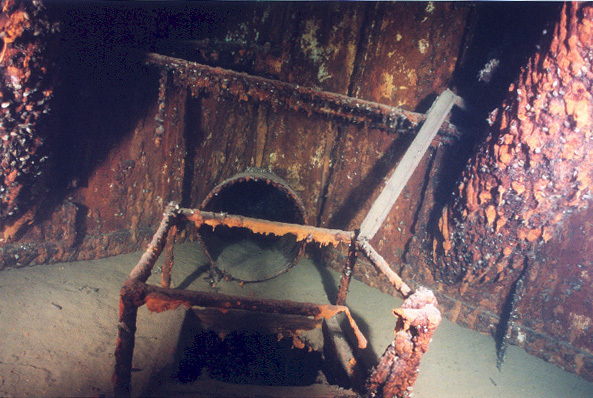 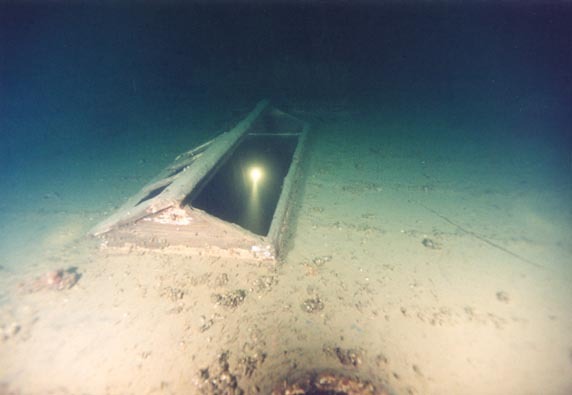 One of the cabins has the metal bed frame  the only thing remaining from the full bed that survived so many years underwater. 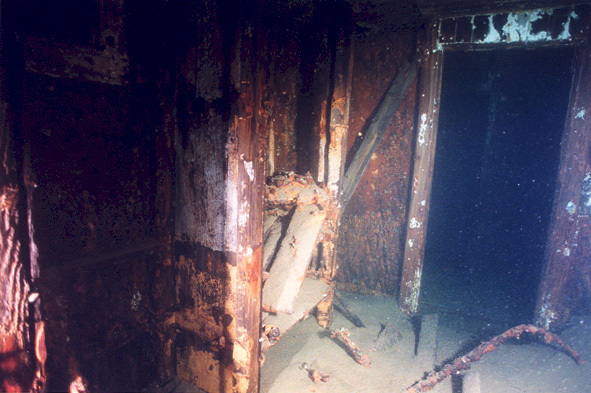 Some other the pieces of wood might have been the cabinets and shelves. 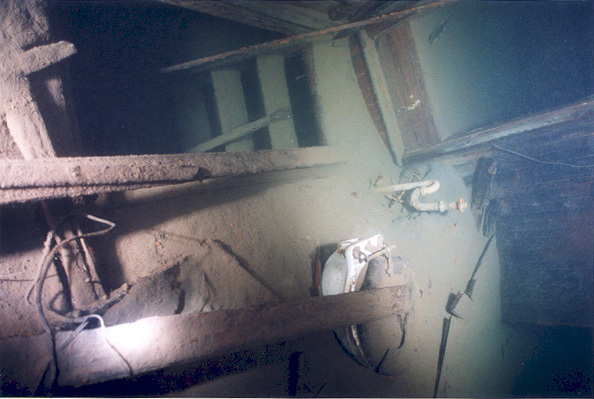 Yet another cabin had the light bulb still intact and floating in the middle of the room. 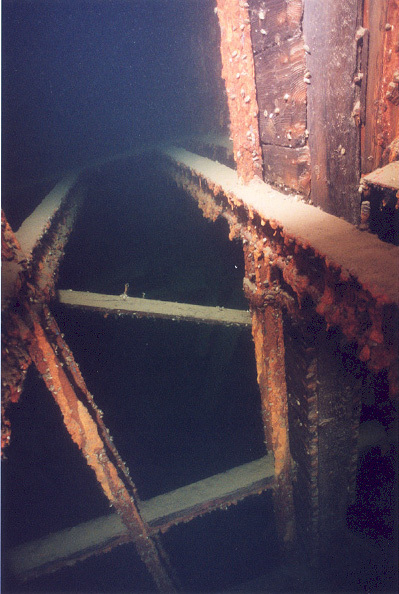 Engine room deserves more than one dive. 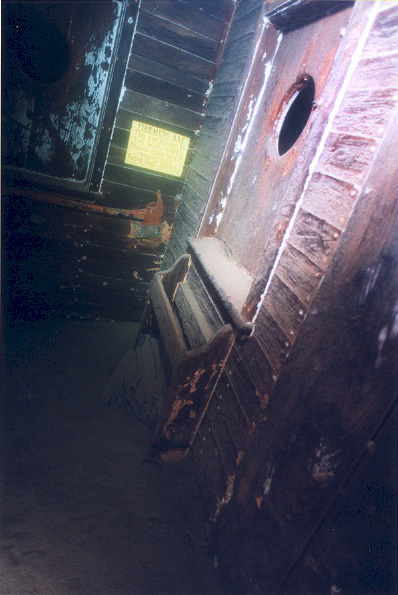 There are two access points from the companionways as mentioned above. 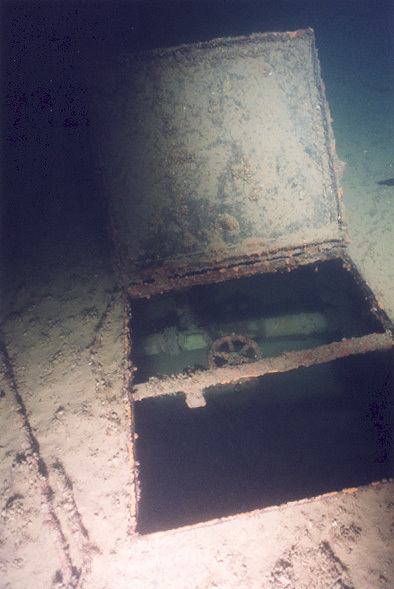 The easiest way to access it is through the broken skylight right above the triple expansion engine. 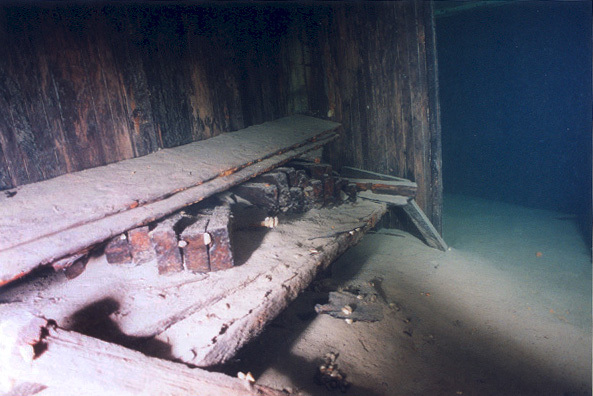 The room is huge and full of very interesting artifacts. 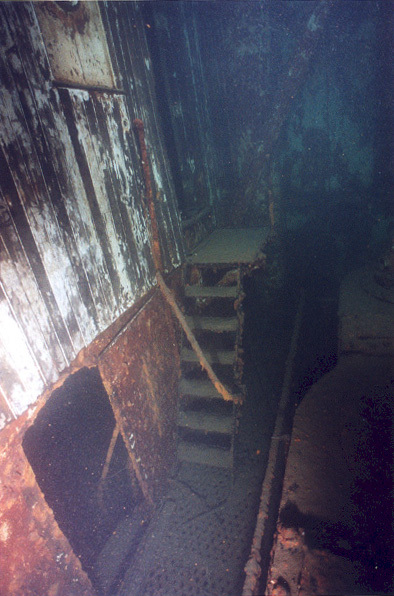 The staircase leading down provides the access to lower levels of that room. 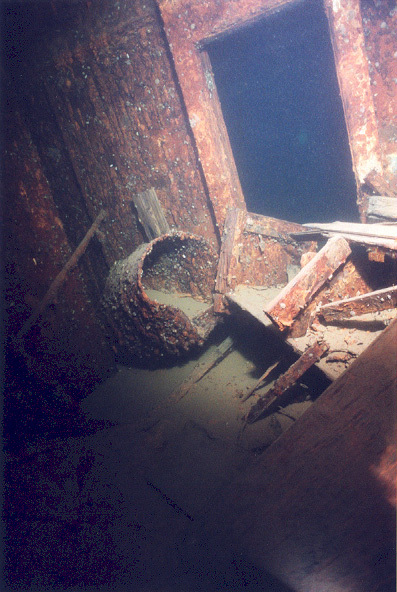 It is possible to have a circular swim on at least two different levels. 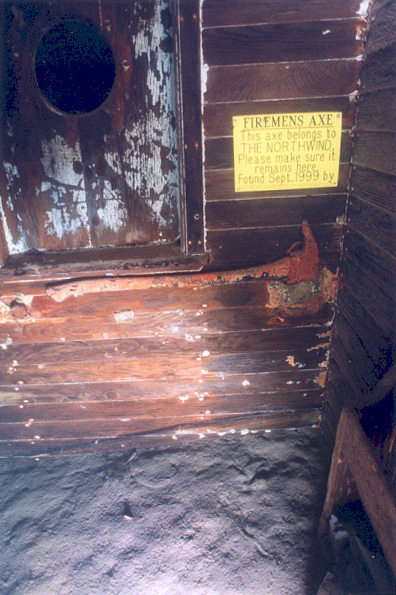 One lever lower than companionways and on the port side of the engine room is the entrance to the tools room. 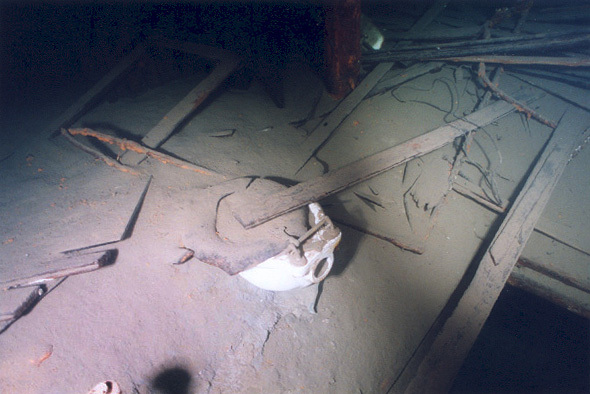 There are lots of artifacts there as well, guarded by the local resident turbot fish. 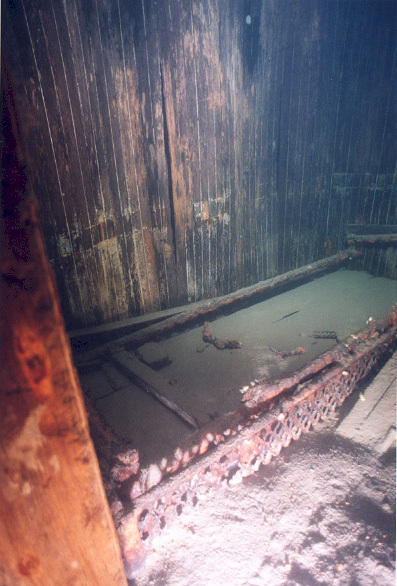 Some of the tools are so covered with rusticles, that it is impossible to say what they used to be. 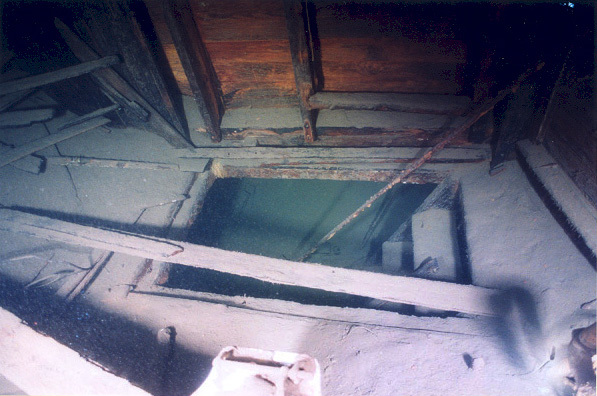 The exit form the tool room is either back towards the engine room, or through the side door and towards the boilers. 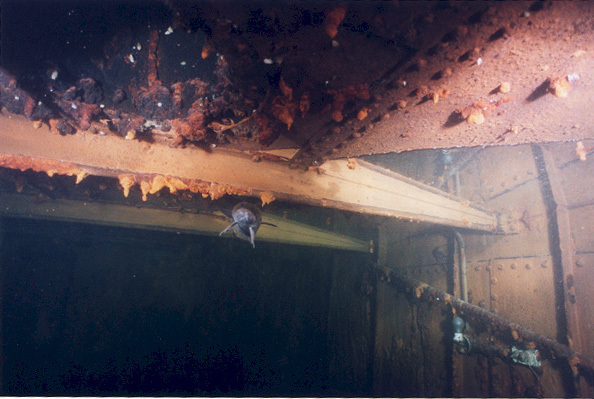 Having exited from the boilers' space and back to the deck, one would notice the fallen smokestack of huge dimensions. 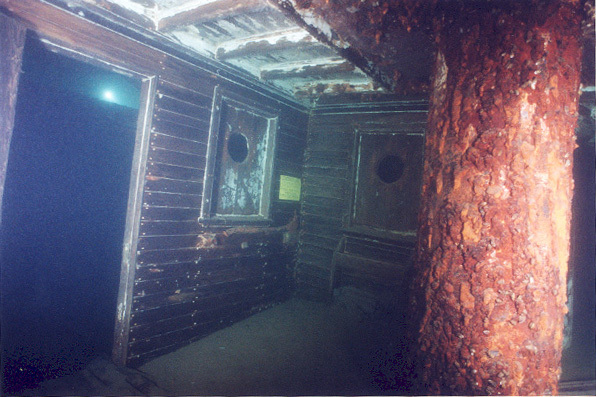 Nearby is an air vent opening  still bright red after the passage of all these years. 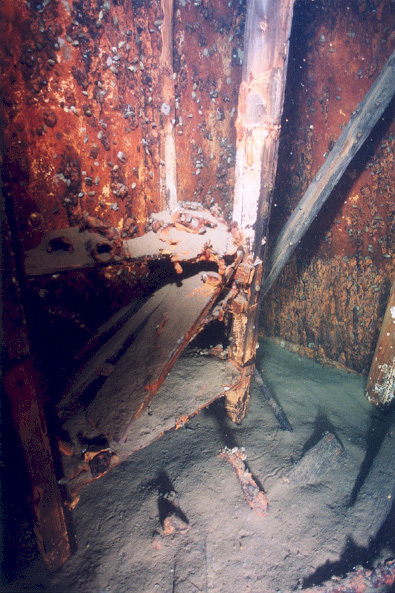 Moving further towards the bow, one would pass above the cargo hold openings as well as the remains of the mid-ship cabins and some other main deck items. 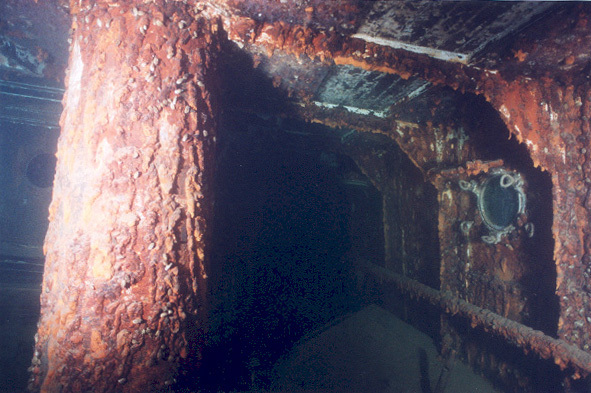 Cargo holds are empty with no remaining bulkheads and the space inside is huge. 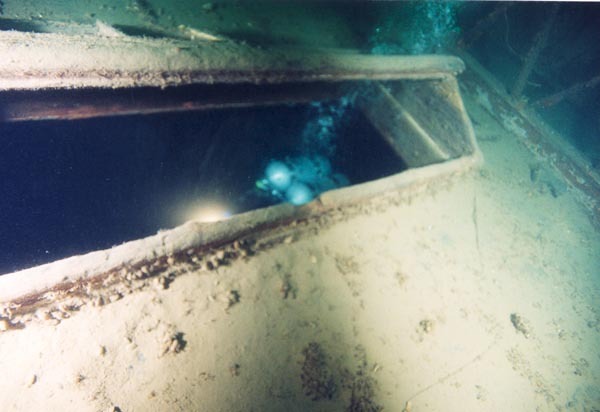 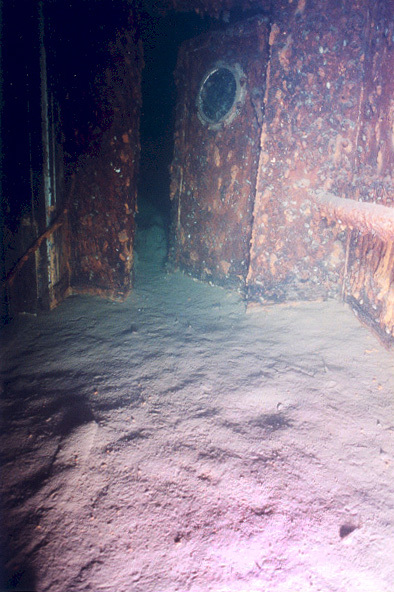 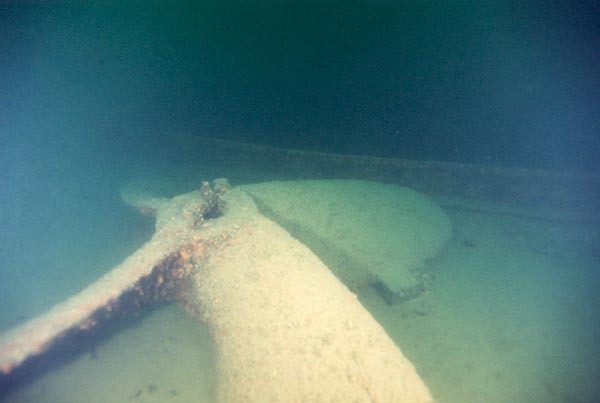 On a particular bad viz day, it is possible (and had been done) to accidentally swim into the cargo hold opening w/o realizing that you are actually inside the wreck. 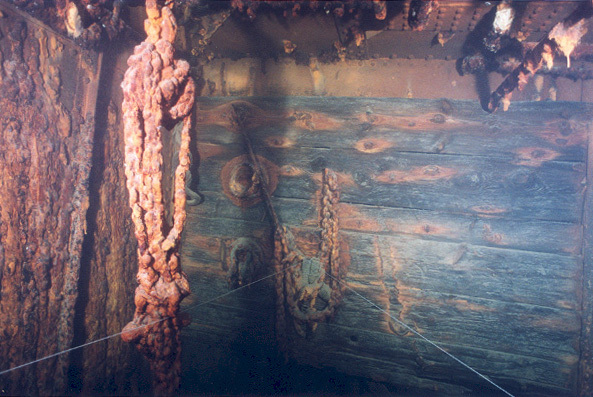 Bow sports two huge anchors, complete with the chains and the winch. 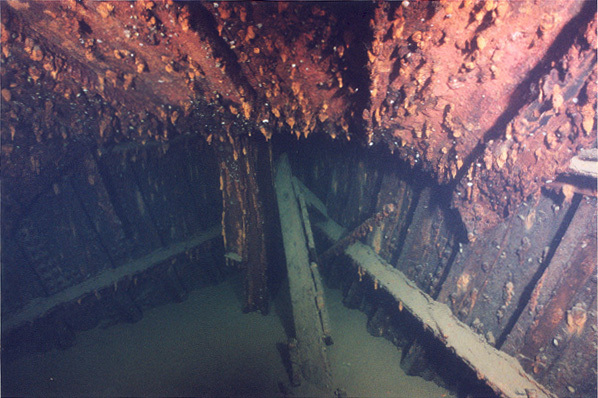 The forecastle is mostly empty and easy to penetrate. 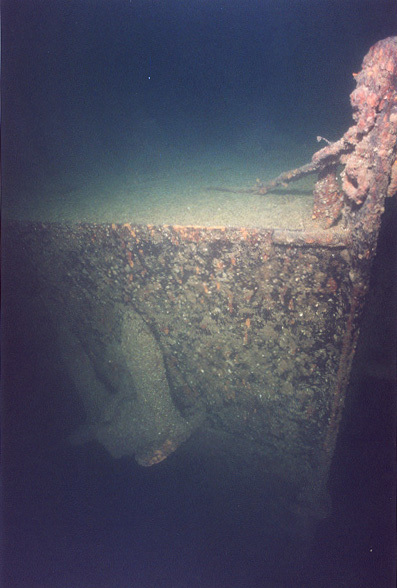 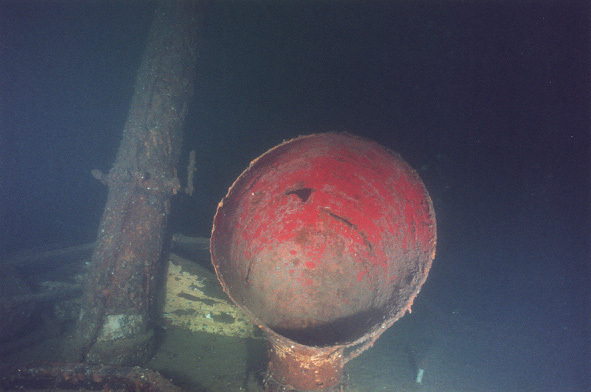 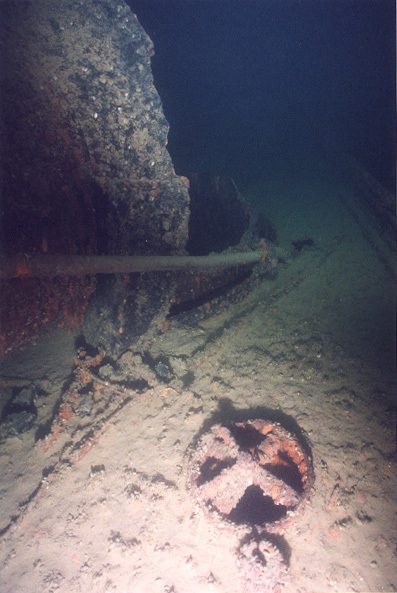 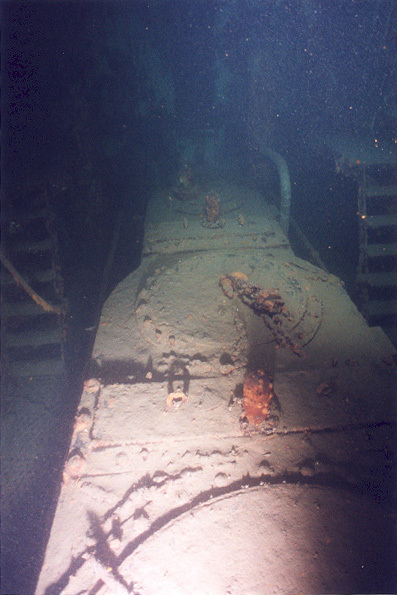 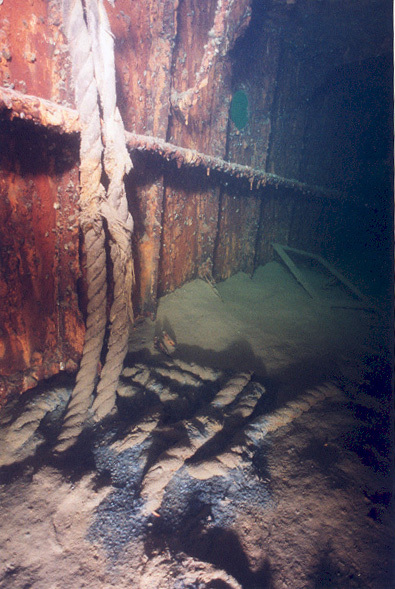 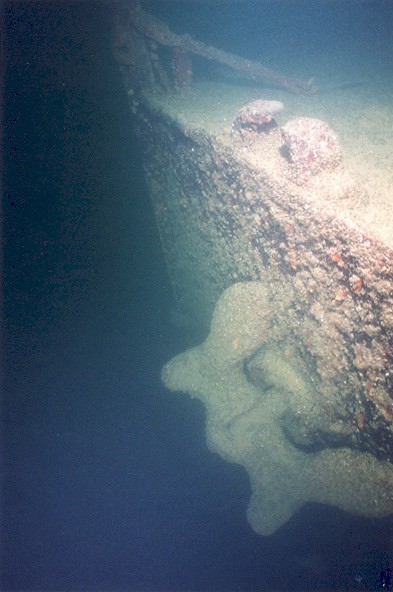 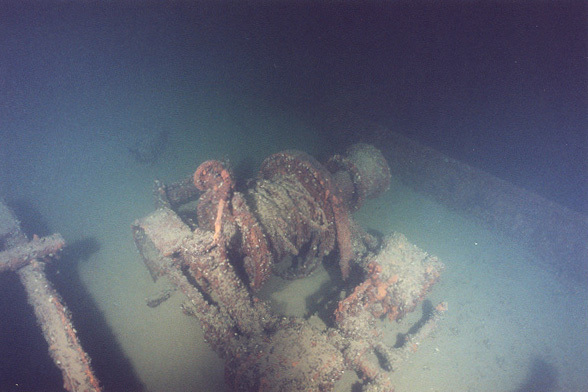 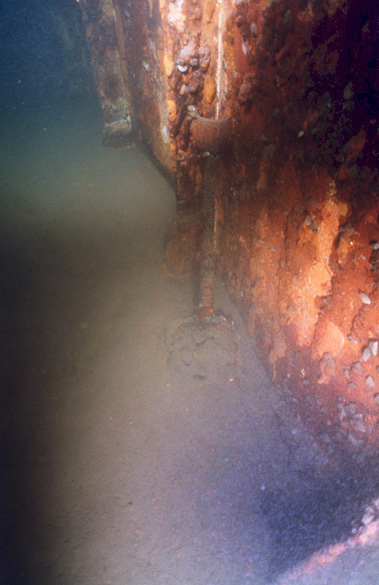 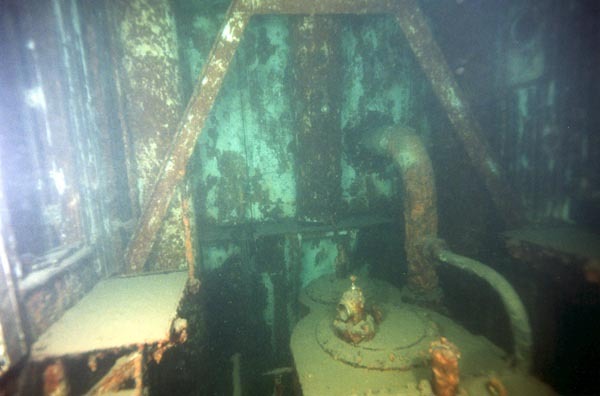 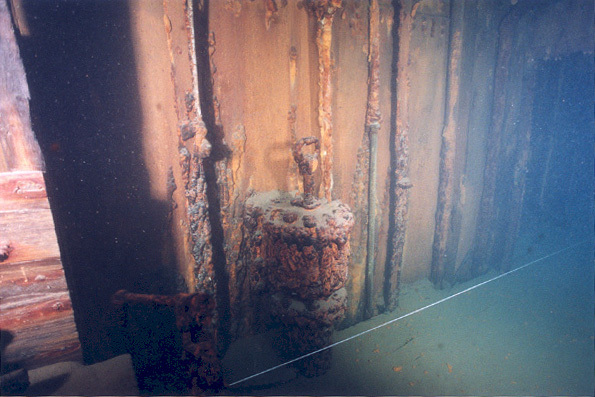 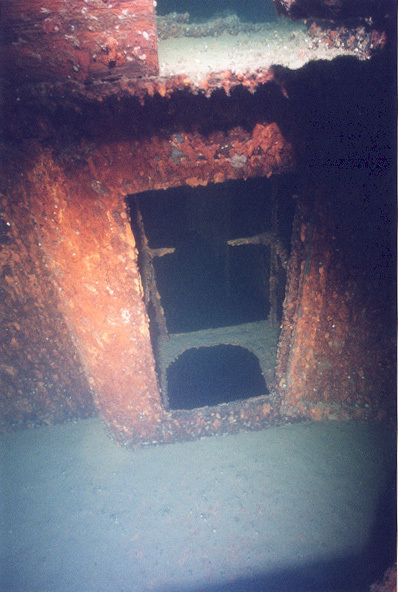 One of the sides of the forecastle was likely used for storage as is it filled with partially collapsed shelves. 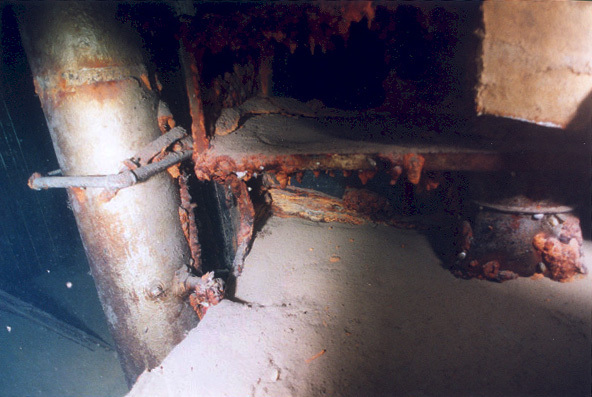 Hazards include depth (max 128ft), darkness (it is very dark), silting (especially for penetration) and cold.